Medically Reviewed by OBGYN Kimberly Langdon MD. Kimberly is a retired University-trained obstetrician/gynecologist with 19-years of clinical experience and she has delivered over 2000 babies. There are many things to think about when you’re creating your birth plan, and whether you want to opt for delayed cord clamping (DCC) is one aspect you also need to think about carefully. There are a number of benefits to DCC and an increasing number of women are opting for it as part of their birthing experience. However, before you make your decision you need to know what delayed cord clamping is and what benefits it provides. Commonly known as DCC, this is a decision regarding when to clamp and separate the umbilical cord from your baby to the placenta. The umbilical cord delivers nutrients, blood and oxygen, and stem cells from you to your baby while your baby is in the womb. This continues for a short time after birth while the cord is still pulsing. Most commonly, the umbilical cord is cut immediately after birth. With DCC, the cord is left connected until it stops pulsating. After that point, the cord is cut in the usual way. The reason for this change in practice is because your baby loses out on quite a lot of fresh blood and nutrients (around 214g) if the cord is cut immediately after birth. More and more units are implementing the new NICE guidelines which advises that the cord be left intact for between 1 to 5 minutes. If the baby needs to be removed for support, such as breathing problems, then the cord can be cut immediately. DCC has been shown to have some great benefits for baby’s health and overall development. Let’s explore the main five. Delayed cord clamping can help with your child’s development, sometimes for up to four years of age. Studies have shown that children who had DCC had better neuro-development, including better fine motor skills and social skills. It was found that this is even more beneficial for boys. Delaying cutting the cord for three minutes can help to reduce the risk of developing anemia during the first year of a baby’s life. This is due to the extra blood and nutrients which are passed from the umbilical cord to the baby in those few minutes. Around one-third of a baby’s total blood volume is in the placenta, so it makes sense that to wait and allow that extra amount of blood to be transferred to the baby after birth. Studies have shown that clotting factors are improved, platelet levels are increased and overall circulation is boosted. The extra stem cells which are delivered to the baby by the placenta in those few minutes can play a huge part in the development of some of your baby’s most vital systems. Improvements in the immune system, central nervous system, cardiovascular system, and respiratory system have been noted. Premature babies and babies with low birth weights can really benefit from DCC. These babies often have better blood pressure readings, need fewer blood transfusions, and have less risk of other serious conditions than their counterparts. Are There Any Situations Where DCC Wouldn’t be Suitable? We mentioned earlier that if the baby requires breathing support after birth the cord should be cut straight away to allow that support to be given. A few other situations where DCC isn’t suitable include if the mother is bleeding heavily after birth or in cases of placental bleeding or abruption. If the cord is damaged or bleeding, DCC may not be appropriate. A tight nuchal cord (cord around the neck) that cannot be reduced must be clamped and cut before the baby’s torso is delivered. 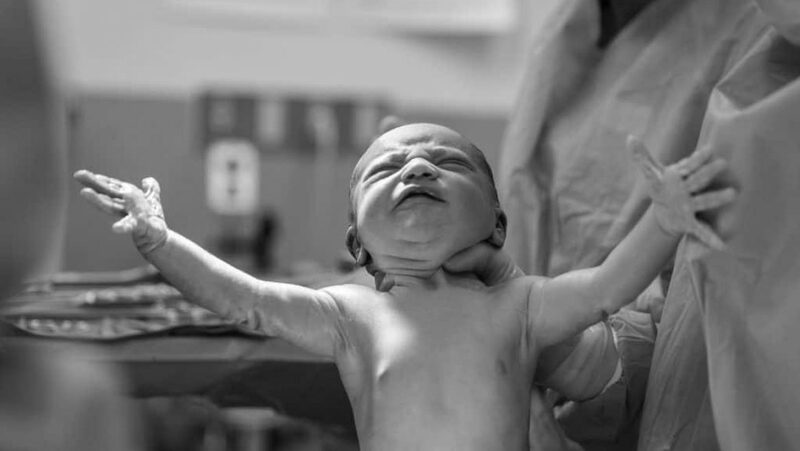 It is possible to have delayed cord clamping when having a cesarean section whether it is an elective section or an emergency one. For this reason, you should put DCC on your birth plan and make sure your midwife or obgyn are aware of your wishes. Most units are already practicing DCC but there may be hospitals where it is still not standard. Having this on your birth plan flags it up and ensures that you get what you want for your baby. Many women also worry about not being able to have DCC if they are given an injection to deliver the placenta. DCC is still an option even in that case but the injection may be delayed. Are There Any Disadvantages to Delayed Cord Clamping? Some studies have shown that DCC might increase the risk of jaundice in the baby’s first week of life. There isn’t enough evidence to support or deny this for certain but jaundice is a common condition for newborn babies regardless of whether DCC was performed or not. You should discuss your options further with your midwife or doctor. Is Back Labor Worse Than Belly Labor? Craving Weird Smells – The Pregnancy Super Power No-one Wants! Can Being Pregnant Make You Feel Super Horny? Some of the links on Pregged lead to sites we are affiliated with, such as Amazon, and we may earn revenue from them.